Photo from Friends of Wisconsin State Parks. Park Superintendent Brian Hefty credits his employees and the Friends of Wyalusing State Park with the appearance and popularity of the park. 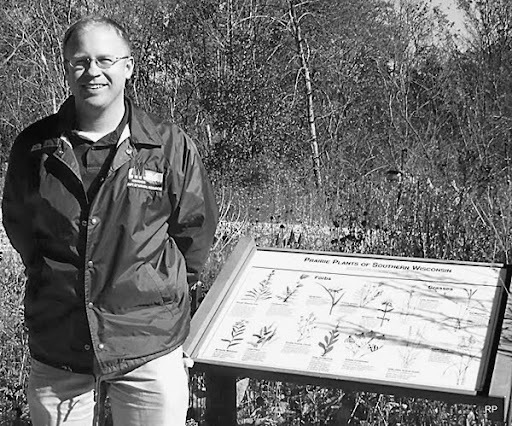 Wyalusing Park Superintendent Brian Hefty has been selected by the Friends of Wisconsin State Parks association to earn the 2009 People's Choice Award for the state park system. Hefty, who has worked for the state park system for 17 years, and has been with the Wyalusing unit (which encompasses both Wyalusing and Nelson Dewey Parks) since November, 2003, said he believes the reason for the award relates to the many improvements made to the facilities at the park, especially in the maintenance and appearance of the buildings and grounds. He is quick to add, however, that most of the credit goes to his staff and the Friends of Wyalusing volunteer group. "We have," he said, “a dedicated Friends group and a great team; I'm really lucky that way." The nomination process was open to all 72 land managers across the state, and visitors, campers, volunteers and employees were all able to make suggestions. The Friends group, said Hefty, has supported and funded several needed projects to upgrade facilities and enhance interpretative programs. They have also recently established an endowment fund to provide permanent support for the park's educational, interpretive; recreational and conservation needs. Bev Pozega, who works in visitor; services at the park, said that from an employee's standpoint, Hefty would never ask anyone to do one thing he himself wouldn’t do. She cited as an example that he cleaned all the windows in one of the park shelters. "How often do you find a park superintendent doing that," she asked.